Are you a University of Faith Graduate? Let’s look at the first attendee and graduate to the University of Faith. Isaiah 51:1-2 says, “Listen to me, you who pursue righteousness and who seek the Lord: Look to the rock from which you were cut and to the quarry from which you were hewn; look to Abraham, your father, and to Sarah, who gave you birth. When I called him he was only one man, and I blessed him and made him many” (NIV). In Isaiah, we are encouraged as believers to look to the first attendee of the University of Faith because we are cut from the same rock. We are going to look at Abraham, and the first few years of his life. We’re going to see why we are the way we are. Abraham lived in a pagan world. He wasn’t born into a family of faith. How many of us are not born into a family of faith? I’m not talking about growing up in the church. Going to church does not make you a Christian just like going to McDonald’s doesn’t make you a hamburger. I’m talking about born again believers who love the Lord with their whole heart, mind and strength. Abraham had no examples to follow. His family might look a lot like your family. There was a form of godliness there, but they worshipped idols. They denied where the real power came from. 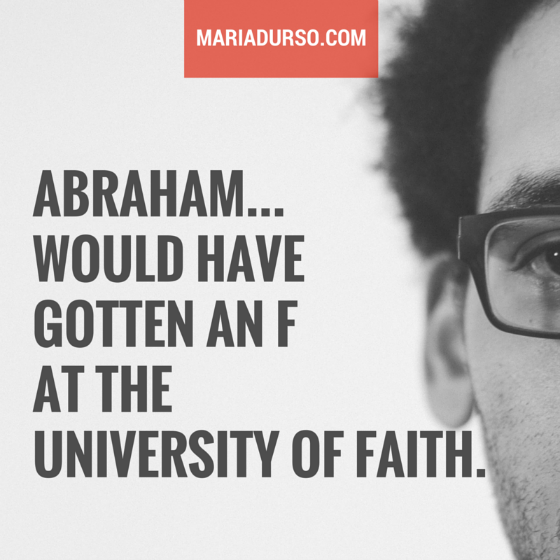 If we were going to give Abraham a report card on Following Directions 101 in the first forty-four years of his attendance of the University of Faith, he would have gotten an F.
Abraham is the father of our faith, and he would have gotten an F at the University of Faith. It took Abraham forty-five years to graduate the University of Faith. Every time this poor guy got back on his feet, and got back to the teacher–he was hit with another trial. Does that sound like your life? I want to tell you why Abraham is the father of our faith. He gets an A+ in trusting in God and His promises. Yes, he was really horrible at following directions. Yes, he was really horrible at sticking to what God told him what to do. But Abraham gets an A+ because every time he messed up, he got back up, and got back to God. He is the father of faith because He has faith in God. He doesn’t have faith in himself or in faith itself. Abraham has faith in God knowing that if he can get back to God, there will always be way for him. The Lord had said to Abram, “Go from your country, your people and your father’s household to the land I will show you (Genesis 12:1, NIV). God had already spoken to Abraham. Did you catch that? God had already given him direction in Genesis 11:31-32. God said to leave your country, leave your people, leave your father’s household and go! This call is a lot like our call. When we receive salvation, we are called to separate from the world as we know it. It’s a call to separate from the familiar. God is telling Abraham that He will show the way. He is the leader. He is in the drivers seat. He wants Abraham to follow Him. Abraham is to no longer do what he wants and expect God to bless it. How many Christians live like that today? Abraham’s going to be blessed by doing what God tells him what to do. We are to do the same. We are to leave our cultural ties. To leave our old mentality. The labels that our family has put on us. The religious affiliations. Who cares what your mom or dad did! When you meet the Lord, you have to do what the Holy Spirit tells you to do. “I will make you into a great nation, and I will bless you; I will make your name great, and you will be a blessing. I will bless those who bless you, and whoever curses you I will curse; and all peoples on earth will be blessed through you” (Genesis 12:2-3, NIV). Nobody blesses like God the Father blesses. And the blessings of God will make up for more than any loss that you will incur. Even when you mess up. Even when you do things you are not supposed to do. God says He will identify with Abraham’s offspring. He will bless those who bless Abraham and curse those who curse him. In other words, any cause of yours is a cause of mine. Any fight of yours is a fight of mine. We are children of Abraham. In next week’s blog we’ll look at exactly what God had said to Abraham and what it cost him by not obeying completely. Question: What does your report card say in the University of Faith?